Birds Pro HD is another wonderful educational nature app featured in our At-A-Glance: Outdoor Apps For Kids post that provides great information on a variety of birds. With high quality images, interesting bird facts, and many other great features, this app will encourage families to get outside and explore the birds that live in their area. One of the best features in this app image quality that in the variety of photos included for each bird. There are a variety of images available for each species that allow users to birds of various colors, ages etc. Also included are very clear audio files for each species. Not only are there bird calls, but the calls are separated into different categories as it applies to each species. For instance, the Golden Oriole has a song, alarm call, and a regular call that is included. With so many clear and colorful images and wonderful audio, the developers have done a very nice job of creating an appealing bird app that is great for children and adults of all ages. 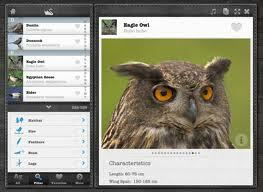 Similar to the other Nature Mobile apps, Birds Pro HD has a wide variety of information for each species included. In addition to the scientific names of each bird, there are also unique characteristics, beak type and shape, feather colors, reproduction information, habitat, and diet information. This ample information is also organized in a way that makes it easy to read and learn about each species. While this is more of an educational app, there is a quiz section that allows users to test their knowledge of each species. Parents can also get children involved by using this app on nature walks or hikes to try and find as many of the birds included in the app as possible. The free version of this app includes 15 species, however for a pretty hefty price of $10.99 users get an additional 257 bird species, 1500 additional images as well as an endless quiz game. When you consider what you might spend on a reference book with this type of information, this doesn’t seem unreasonable, however it is definitely more than the cost of some other apps that are similar to this one. Parents will want to check out the free version prior to purchasing the full version to decide if they think it is worth paying the full price. This app is great for children interested in birds and bird watching and is organized in an easy to use manner. There are no social media links, though there is an in app purchase links and links to additional information via Wikipedia as well as a “more apps” button by the same developer, so parents will want to be aware of that. One thing is for sure, children with an interest in birds will enjoy learning about the different species and using this information out in the field as they locate and take notes on various birds they find.